If you’ve read Death Note and started reading Bakuman because it’s by the same creators then you’re coming into this series with the wrong mind set. While there may be some similarities that I am unaware of, Bakuman has none of the supernatural elements, or philosophical overtones that Death Note was popular for. 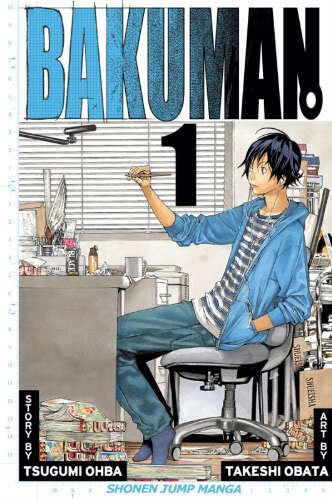 Though Bakuman has no fantasy or sci-fi elements in it, the story starts off with a strange Evangelion vibe. That probably has to do with Mashiro Moritaka, the main character, being one of the most depressing protagonists I’ve ever read. He starts off with an internal monologue about how life isn’t worth living, and he’s given up on life, etc, etc. I’m trying very hard not to start flinging the word ‘Emo’ around, but I’m afraid I can’t make any promises. Mashiro forgets his school notebook, with a sketch of the girl he likes, at school, and goes back to get it. When he arrives back in his classroom, he finds his classmate, Takagi Akito sitting in the room with Mashiro’s notebook. After a little bit of self referencing from the authors Takagi tells Mashiro that he wants him to create manga with him. With Mashiro working as the artist, and Takagi as the writer. I’d like to take a break here and point out that Takagi reminds me of myself when I was younger. Ask any of my friends from high school, they’ll confirm that I went around trying to get any of them that could draw to illustrate comics that I wrote. Mashiro refuses, citing statistics about how impossible it is for them to become manga artists. While it may seem far too clinical for a narrative, I like how it fits in there, and ups the stakes for the characters later on. Takagi refuses to take no for an answer, and Mashiro only gets rid of him once he says he’ll think about it. The manga goes into a bit of detail about Mashiro’s uncle, who was a manga artist who worked himself to death. I like this because it gives Mashiro proper motivation to refuse. Not many people would want to do the same thing that already took the life of a relative. Takagi calls him, and convinces him to come visit Azuki, the girl Mashiro has a crush on. Takagi says he has something he wants to tell her, and Mashiro goes with him, despite thinking that Takagi plans to confess his feelings to her. When they get to Azuki house however, Takagi instead reveals his plan to become a mangaka, and that he’s found out that Azuki wants to become a voice actress. Mashiro is dumbfounded by how ambitious the two of them are, and face with every man’s one weakness, a cute girl looking in his direction, he tells her that he’ll be doing the art while Takagi does the writing. Your mileage may vary on what happens next, but personally I like it for dispelling any unnecessary romantic drama. I may be a romantic at heart, but there’s a reason I don’t read Shoujo. Mashiro proposes to Azuki, asking her that once they get an anime made of their manga, and she voices the heroine they’ll get married. Surprisingly she accepts, and after this Mashiro finds the motivation he needs to become a mangaka, though he has not yet accepted Takagi as his partner. Now, I know it may sound like I spoiled a good portion of the plot. Trust me, I didn’t. This is just the beginning. For me a review that just says whether the reviewer liked the manga or not isn’t quite enough. I like to know a little bit about the story before deciding whether I want to invest money into a new series. The only way to do this is to present the story as it is, with a little bit of commentary by me, and let you make your own choice. That being said, I didn’t tell you the whole story, there’s still much more for you to discover on your own. I’m not entirely sure what made me start reading this series. It wasn’t because it’s by the same guys who did Death Note, I never read that series. What really got me interested in this series was the relatable goal that the two protagonists have. I’d love to make my living as an author, which to me is exchangeable with comic artist or writer, artist, mangaka. Anything that is creative really. In fiction there are generally two types of protagonists. There’s the role model, the character who we look up to and want to emulate, commonly used in Superhero Comic Books and Action Movies. Then there’s the Everyman, the character that is just a regular guy, who the audience can relate to due to his regularity. Bakuman manages to have both of these archetypes in its main cast. Mashiro is the Everyman, who, while he may be a bit over the top with his depressing attitude, is still voicing the feelings of many in the target audience. Namely that there isn’t anything to life other than living an ordinary life, working at an ordinary job, etc. I can’t speak for anyone else, but I know for a fact that I’ve felt like this every once in a while. While it may come off as heavy handed at first, I find it helps to think of his depressing monologue in the beginning as a summary of his attitude up to that point, rather than everything that’s on his mind at the time. Takagi is the role model character. Not an action hero or anything like that, he’s a more down to earth version of the role model. He’s not perfect of course, there is still plenty for him to learn that Mashiro actually knows, allowing the two of them to trade role model and everyman status as the situation warrants. What makes Takagi the role model character is that unlike Mashiro, Takagi is the one who initially has a goal, as opposed to the despondent Mashiro. And in a genre where reaching your dreams is a main theme, this is what sets Takagi apart as the role model character. Volume One has a fairly tightly contained storyline. It follows the proper rising action and climax, while somehow being very sparse on the action itself. A lot of talking happens in this manga. It makes for a much longer read than say, Bleach, but may not be for everyone. Personally I like having to do a lot of reading, so that doesn’t bug me at all. What does bug me is how many times Death Note is referenced by Takagi. Three times. That goes beyond self reference to self advertisement. It’s like Ohba is trying to remind people that he wrote Death Note. The cover is nice, a simple illustration that tells you what you need to know about this series. It’s about creating manga. Don’t like, don’t read. Or read and complain, far be it from me to take that right away from you. In-between each chapter we get to see sample storyboards, known as Names in Japan, from both Ohba and Obata. Very appropriate for this series, and fun to look at. I can’t tell you whether you’ll like this series or not, hopefully by now you’ve made up your own mind. All I can say is, I love it, and think you should at least give it a chance.